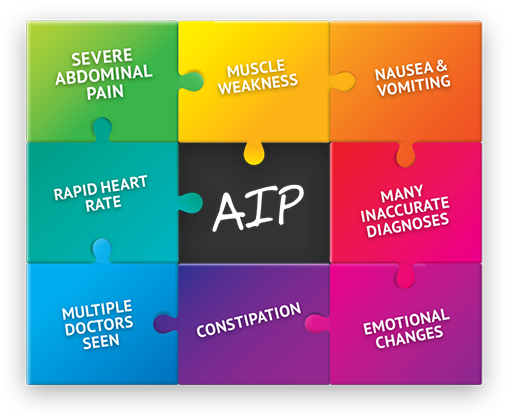 Learn more about Acute Intermittent Porphyria (AIP), a serious and painful condition—and get the help you need to finally put a name to the pain. If you’ve been searching for the cause of your unexplained severe abdominal pain and other symptoms—such as muscle weakness, nausea or vomiting, constipation, rapid heart rate, or emotional changes—there’s something you should know: these may be signs of a rare, serious disease called Acute Intermittent Porphyria (AIP). Learn more about this painful condition–and get closer to finally putting a name to the pain. can increase your suspicion of AIP.